Since industrial water treatment is a complex family of technologies and systems, this article will focus on giving a high-level overview of the technologies that are typically used and summarize how they work, helping you to better understand the best possible solutions for your facility. What is an industrial water treatment system? Raw water is any untreated water that occurs naturally in the environment, including sources such as rainwater, groundwater, wells, lakes, and rivers. In industrial settings, raw water may be used for cooling, rinsing, product formulations, or even human consumption if it is properly purified. Raw water treatment systems are used for pretreatment and optimization of source water, usually with an eye toward improving production efficiency and process performance for a particular application. Examples include pretreating cooling tower/boiler feed water, process/production water, and/or water for drinking. Often, raw water treatment is focused on protecting downstream equipment from scaling, fouling, corrosion, and other forms of damage or premature wear due to contaminants present in the source water. Raw water treatment systems typically remove suspended/colloidal solids, silica/colloidal silica, iron, bacteria, and hardness. Intake. Raw water is drawn into a plant through gravity and/or pumps. The water is usually passed through a metal grate or mesh screen to prevent large objects from entering the system. Clarification. The water then continues for clarification, which is a multistep process used to remove suspended solids from a solution. Clarification begins with coagulation, where chemical and/or pH adjustments cause particles to begin clumping together, followed by flocculation, which involves physical agitation to encourage formation of larger particles. Then comes a sedimentation step, where the stream flows to a gravity settler that allows solids to settle to the bottom in what is known as a sludge blanket. Finally, the stream is filtered through a gravity sand filter to trap any small particles that did not settle out. Disinfection. If biological contamination and/or water potability is a concern, the water may then be disinfected to remove any pathogens. Disinfection may be accomplished through the application of chemical disinfectants (e.g. chlorine), physical disinfectants (e.g. UV or heat), as well as some forms of membrane filtration. Lime softening. In some cases, a lime softening step may be added to reduce hardness in streams with high mineral or sulfate content. The process involves the application of lime or lime soda to raise the pH of the stream, which in turn encourages mineral constituents to precipitate out of solution. Ion exchange (IX). In some cases, the raw water treatment system may include an IX unit for hardness removal, or other specialized treatment needs. In IX softening, a stream is directed through a strong acid cation resin that is “charged” with sodium; as the water flows through, the resin captures the hardness-causing calcium or magnesium ions, while releasing the sodium ions into the stream. Distribution. Following treatment, the water is pumped or otherwise routed for use elsewhere in the facility. Membrane filtration. As microfiltration (MF), ultrafiltration (UF), and nanofiltration (NF) systems have become more affordable in the last few decades, they are increasingly being used in place of conventional technologies such as clarification and lime softening. Boiler feed water treatment systems are used to protect boiler unit components and piping from damage due to certain contaminants present in the boiler and/or makeup feeds. These contaminants may include dissolved solids, suspended solids, and organic material, such as iron, copper, silica, calcium, magnesium, aluminum, hardness, and dissolved gases. 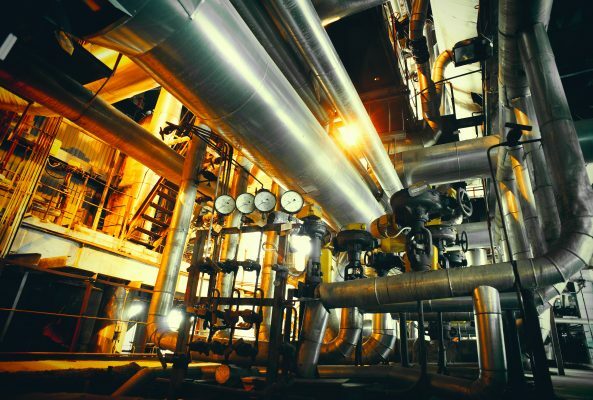 Without proper treatment, boiler feed water can cause scaling, corrosion, and fouling of the boiler and downstream equipment, which can result in costly plant downtime, expensive maintenance fees, increased fuel consumption and boiler failure. Makeup water intake. As boilers are used, they lose water to steam consumption, loss of condensate return, and leaks. This water must be replaced with what is known as makeup water. Makeup water may be drawn from a treated city supply or a raw water treatment system. Filtration. The stream is typically filtered through one or more filtration units for removal of sediment, turbidity, and organic material. When used for pretreatment ahead of IX and other equipment, membrane filtration units can be a cost-effective means of preventing fouling and excess maintenance of downstream equipment. Softening. IX is often used for removing hardness from boiler feed water, including bicarbonates, sulfates, chlorides, and nitrates. This is accomplished by using a softening resin, which is typically a strong acid cation resin that allows it to effectively capture hardness ions from the stream. Dealkalization. Alkalinity can cause foaming and carryover in boilers, as well as corrosion in piping. Therefore, boiler feed streams are often treated with strong anion IX, or weak acid IX followed by degasification, which serve to remove bicarbonate, sulfate, and nitrate ions, reducing pH. Reverse osmosis (RO) and nanofiltration (NF). RO and NF are not always used for boiler feed water treatment, however, they can be useful for removal of bacteria, salts, organics, silica and hardness. RO and NF are both types of membrane filtration, meaning that they employ a semi-permeable membrane to capture any contaminants too large to fit through their pores, while allowing water molecules to flow through. Primary ion exchange (IX). For large volumes of water or high pressure boilers, deionizers may be used instead of membrane filtration. IX typically produces water of comparatively higher quality and resistivity, and better yields. Deaeration or degasification. Following all other treatment steps, the makeup water and condensate from the boiler system are combined and degasified. Deaeration/degasification is the removal of dissolved oxygen and carbon dioxide from the liquid stream, which is important for preventing corrosion. Polishing. Depending on the boiler requirements, polishing technologies may be required. This step can follow RO or primary IX. Typical polishing technologies include mixed bed deionization (DI), electrodeionization (EDI), or offsite regenerable DI. Distribution. Following all treatment steps, the boiler feed water is piped to the boiler, where it is heated to form steam. The condensate can then be combined with treated makeup water, and the cycle begins again. Although these steps represent common boiler feed water system trains, it is important to understand that an individual boiler’s unique makeup/chemistry is an extremely complex calculation that will dictate the technologies needed. We recommend consulting the boiler manufacturer for their water purification specifications. You should also consult a water treatment specialist to conduct a thorough treatability study, which can help determine which combination of these technologies would best suit your boiler. Cooling tower water treatment systems are used to protect cooling tower components from damage due to contaminants present in feed water, circulation water, and/or blowdown water. These contaminants may include chlorides, hardness, iron, biological materials, silica, sulfates, TDS, and or TSS. Untreated cooling tower feed water can cause scaling, corrosion, biological growth, and fouling of cooling tower equipment, which can result in costly plant downtime, reduced productivity, and excessive maintenance or equipment replacement costs over time. Makeup water intake. As water circulates through a cooling tower system, a portion is lost to evaporation, bleed to drain, and leaks. This water must be replaced with what is known as makeup water. Like boiler makeup water, cooling tower makeup water may be drawn from a variety of sources, whether raw water, municipal water supplies, wells, or recycled plant wastewater. In some cases, source water must also be treated for hardness or silica removal and/or pH adjustment. Filtration. Upon intake, the stream is typically filtered through one or more filtration units for removal of sediment, turbidity, and organic material. As previously mentioned, when filtration is used for pretreatment ahead of IX and other equipment, it can be a cost-effective means of preventing fouling and excess maintenance of more sensitive downstream equipment. Softening. If there’s high hardness in the source/makeup water, a softening resin or membrane softener can be used. These contaminants, if present, will otherwise cause scale deposits and rust. Depending on feed water quality, softening can improve the efficiency of cooling tower water use. Chemical addition. Next, the stream will usually undergo some form of chemical treatment, which can include the application of corrosion inhibitors to neutralize acidity; algaecides or biocides to reduce growth of biological contaminants; and/or scale inhibitors to prevent contaminants from forming scale on pipes and other components. Side-stream filtration. Many cooling towers are designed to recirculate water following use. If this is the case, a side-stream filtration unit will be helpful in removing any problematic contaminants that have entered through drift contamination, leaks, etc. About 10% of the circulating water will filter through what is usually a high-quality multimedia filtration unit or SAMCO tube filtration technology. Post-treatment. There are various types of post-treatment options that may be used depending upon plant conditions. If large quantities of water are required for cooling, or if water is scarce at the facility’s location, plants may opt to treat the blowdown water with RO or IX and reuse it. For discharge of blowdown water and/or bleed water, other post-treatment systems may be leveraged to minimize disposal costs or bring the waste stream in line with discharge regulations. A wastewater treatment system is used to convert spent streams into an effluent that can either be reused or safely discharged to the environment or municipal treatment facility. The most appropriate wastewater treatment system will help the facility avoid harming the environment, human health, and a facility’s equipment, process or products (especially if the wastewater is being reused). It will also help the facility curb heavy fines and possible legal action if wastewater is being improperly discharged to either the environment or publicly owned treatment works. The relative complexity of a wastewater treatment system will depend heavily upon the compliance regulations impacting your plant and the composition of your waste stream. While the contaminants present in a waste stream can vary greatly from one process to the next, wastewater treatment systems commonly treat for biochemical oxygen demand (BOD), nitrates, phosphates, pathogens, metals, TSS, TDS, and synthetic chemicals. Clarification. The first step of wastewater treatment is often clarification, which is a multistep process used to precipitate metals, silica, remove suspended solids from solution. Depending on the characterization of the waste water, clarification can be a series of reaction tanks with chemical addition, coagulation, flocculation, sedimentation, followed by filtration. These steps are usually necessary for removal of any fine particulates and/or by-products, some of which can be recovered if they are of value (such as silver or other materials). Disinfection. Pathogens—bacteria, viruses, fungi, or any other microorganisms that can be present in wastewater—can lead to all kinds of health issues, including acute sickness, severe digestive problems, or death. When industrial wastewater contains these harmful pathogens, and is released into the environment, it can spread illness and disease, making their removal or neutralization a key aspect of treatment. Softening. For streams with high hardness or sulfates, a lime softening step may be added to reduce mineral or sulfate content. The process involves the application of lime or lime soda to raise the pH of the stream, which in turn encourages mineral constituents to precipitate out of solution. In some cases, IX or membrane softening may also be used. Special processes. There are also specialized process steps to treat unique wastewater issues, such as the removal of certain metals or organics or to reduce TDS for recycling, among other examples. Since wastewater streams are typically complex and highly variable from one facility to the next, special processes are often required to fully meet wastewater treatment needs. Distribution. Following wastewater treatment, the water is routed for reuse within the facility or, complying with local regulations, discharged to the environment or local sewer. Additionally, because wastewater treatment is almost always subject to fluctuations in composition, flow rate, or effluent requirements, a well-designed system should accommodate such fluctuations and offer options for scalability. Now that you understand what industrial water treatment systems are and how they work, be sure to read more articles on our blog that delve into these systems a bit deeper. Some of the topics we discuss include how much these systems cost, common problems you might see, and how to choose the best system for your facility, among others. 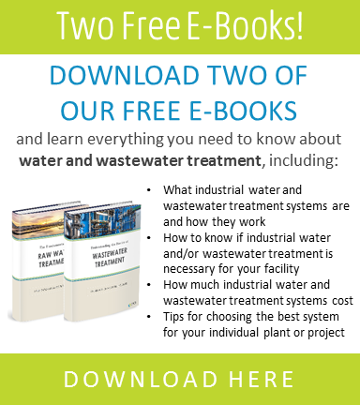 You can also visit our Learning Center to download a range of industrial water treatment e-books that will help you better understand these systems and how they work. SAMCO also has over 40 years’ experience custom-designing and manufacturing industrial water treatment systems, so please feel free to reach out to us with your questions. For more information or to get in touch, contact us here. You can also visit our website to set up a call with an engineer or request a quote. We can walk you through the steps for developing the proper solution and realistic cost for your industrial water treatment system needs.